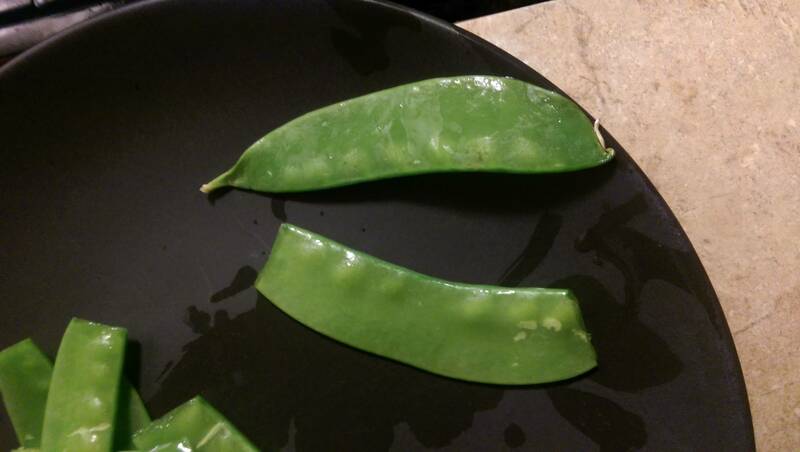 I'm curious if it is customary to trim the ends off snow peas or should I just leave them on and eat them. I always clean them but it is time consuming. The picture shows an untrimmed one on top and a trimmed one in the bottom. I do trim them, but not as rigorously as you do. I really just take off the tips. There is an exception to this though. The ones you show in the picture have been harvested quite young, but this is not always the case. You can have situations where the end that holds the little peas has a tough fibrery texture. In those cases I still take off just a little on both ends, but also try to pull the fibers from the side. I would take off about this much: http://i.imgur.com/omZv79b.png and that's it. Anything more than that and you're taking off far too much. It'll be time consuming to take them off one by one, so what I do is line a bunch of them up, using the back of my chefs knife to line them up straight, then cutting the ends off and repeating on the other side.